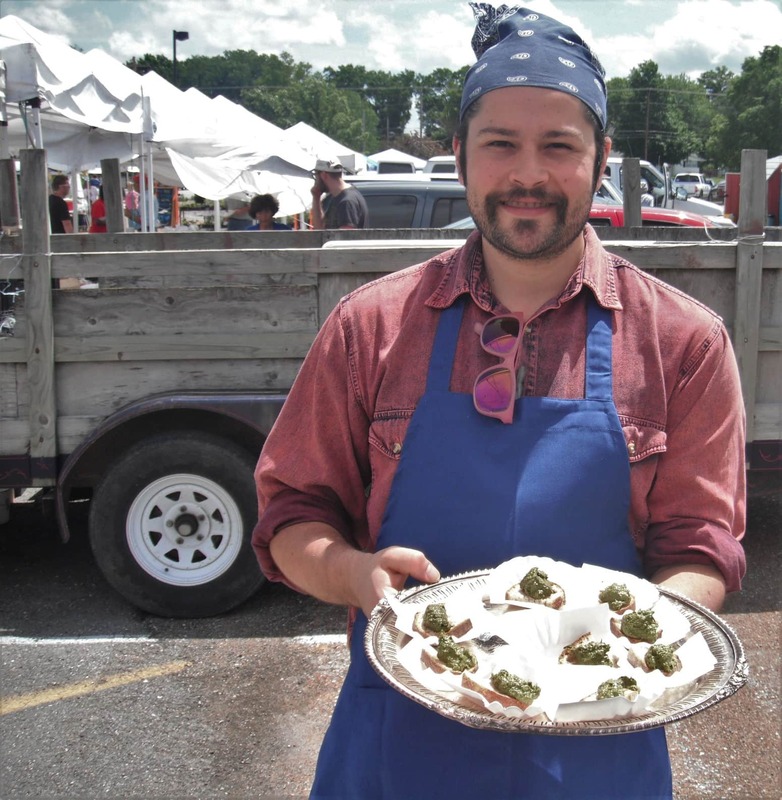 Over Memorial Day Weekend, the Columbia Farmers Market welcomed Max Garcia-Rubio of the pop-up restaurant Traviesos for a food-tasting event. Max prepared a seasonally inspired pesto composed of Mighty Acorn Farm Swiss chard and beet greens, Columbia Center for Urban Agriculture spinach, Sellmeyer Farm green garlic and garlic scapes, and Walloon cheese from Goatsbeard Farm served on Uprise Bakery batard. Market customers commented on the uniquely spicy and slightly bitter flavor that was offered in the mixture of greens and fresh forms of garlic that many of us do not associate with pesto. Traviesos is a cooking collective composed of un-glorified prep cooks, line cooks, and bartenders from some of the best restaurants and bars in Columbia. They cook in existing restaurants and non-restaurant environments for one time only dining events. In better terms they are a pop-up restaurant located in the middle of Missouri, with farm-to-table, garden-to-table, wild edible foraging and Mexican cuisine at the forefront of their mission. Check out their facebook page to stay up to date on their upcoming pop-up events. Later this season, the Columbia Farmers Market will feature seasonal samplings from Range Free on July 23 and Nourish Café and Market on August 20. Join us to learn new ways to use market product from emerging chefs in the Columbia local food scene. **This is not so much a pesto recipe as it is a guideline to making your own variations on basic pesto recipes. Pulse in a food processor: nuts, cheese, garlic, with a few splashes of the olive oil until either a paste is formed or at the very least until the garlic and nuts have broken down a bit. Scrape the sides of the food processor between pulses if not all ingredients are coming in contact with the blades. Add greens to the processor and blend while slowly adding in the rest of the oil, once again scraping the sides if needed. The rotating blades of the food processor will create minor heat causing some of the vibrancy of the ingredients to diminish. To keep the flavors and colors vibrant, try adding one ice cube when processing. If you enjoy the taste of garlic but can’t handle its sharpness, try this. Cover your raw garlic cloves with cold water in a pot and bring to a boil. As soon as the water comes to a boil strain and drop garlic in an ice bath. Repeat this process three times and you’ll find the sharpness is gone while the garlic flavor still remains. In order to have small portions of pesto ready to use at any given time, portion your pesto in either ice trays or 3oz paper cups and store in the freezer.